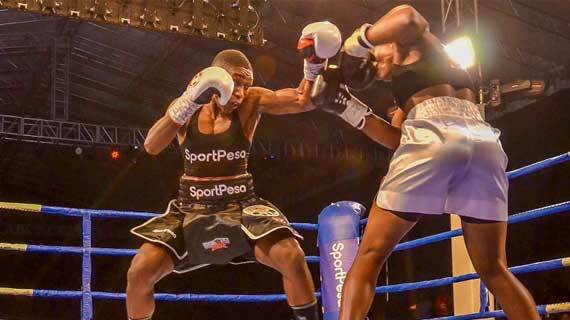 After 10 rounds of exciting punches with Zambian Catherine Phiri, The 'Iron Fist' Zarika who has become the face of Kenyan Boxing in the recent past won on unanimous 3-0 judge's decision. Fatuma Zarika in action against Zambia's Phiri in Nairobi/Photo courtesy of SPN. Kenya's Fatuma Zarika on Saturday night retained her World Boxing Council Women Super Bantam Weight title during the second edition of Nairobi Fight Night held at the Kenyatta International Convention Center. The judges, Fillemon Mweya, Ugandan Irene Semakula and Michael Neequaye scored 99-91, 97-93 and 98-92 respectively all in favor of the home girl Zarika. This was a rematch between the two female pugilists. Affairs in the ring remained tough and unpredictable through the fight with odds looking almost equal for the two boxers. The home girl Zarika ranked high in the third, fifth and eighth rounds and the visitor enjoyed the second, fourth and sixth. Before the last (29) round the ring announcer Maurice Ochieng, also known as 'Mdomo Baggy' read the scorecard up until the eighth round indicating Zarika led 3-0 (79-73, 77-75 and 79-73), it dawned on Phiri that she could only dethrone Zarika by a knockout. She threw powerful jabs forcing Zarika who seemed to be looking for the points release her heavy assaults too. By neutralizing each other's tact, Zarika held on to the lead to the end. The two rivals first fought in December 2017 where 'Iron Fist' beat Phiri on a unanimous 3-0, and whereas the latter welcomes a third fight between them, Zarika said business between them is over. "Opposition between us is over. I have beaten her twice, what else is remaining?" noted Zarika. The victory brings Zarika's record to 32 wins, 12 loses and two draws.